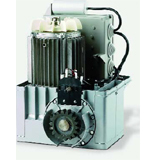 • Maximum performance and continuous service offered by Icaro irreversible gearmotor. 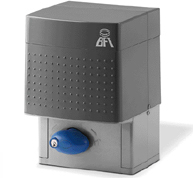 • Design and convenience: major aesthetic innovation and greater casing sturdiness. • Safe release manoeuvre made simple by means of the new ergonomic knob. • Maximum safety with anti-squash protection, thanks to a microprocessor which guarantees innovative torque control and inverts the direction in case of obstacles in opening and closing. • Improved accessibility and management of the control panel, having the control board fitted to the front and a display for programming. • Diagnostic and statistical functions through the display. • Control board preset for management by means of the UNIPRO universal programmer. • 64 codes rolling code receiver inside the control board. • With parameter autoset option for braking, torque and anti-squash functions. 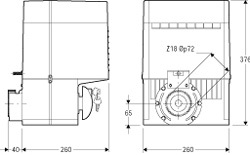 • Version with inductive limit switch available. • integrated rolling-code receiver • self-diagnosis function and centralised command option • LEO control board • Main specifications: supply 230 V ± 10% 50Hz • power 750W • leaf speed 9m/min • max leaf weight 20000N (~2000 kg).